TOKYO, Aug 28, 2018 - (JCN Newswire) - Toyota Motor Corporation (TMC) and Uber Technologies, Inc. (Uber) today announced that they have agreed to expand their collaboration with the aim of advancing and bringing to market autonomous ride-sharing as a mobility service at scale. To accomplish this, technology from each company will be integrated into purpose-built Toyota vehicles to be deployed on Uber's ride-sharing network. Separately, Toyota is investing $500 million in Uber. "Combining efforts with Uber, one of the predominant global ride-sharing and automated driving R&D companies, could further advance future mobility," said Shigeki Tomoyama, executive vice president, TMC, and president, Toyota Connected Company. "This agreement and investment marks an important milestone in our transformation to a mobility company as we help provide a path for safe and secure expansion of mobility services like ride-sharing that includes Toyota vehicles and technologies." As Uber and Toyota look ahead to a self-driving future, this partnership will be critical in realizing self-driving technology at scale. Uber and Toyota anticipate that the mass-produced autonomous vehicles will be owned and operated by mutually agreed upon third party autonomous fleet operators. "The deal is the first of its kind for Uber, and signals our commitment to bringing world-class technologies to the Uber network," said Dara Khosrowshahi, Uber's CEO. "Our goal is to deploy the world's safest self-driving cars on the Uber network, and this agreement is another significant step towards making that a reality. 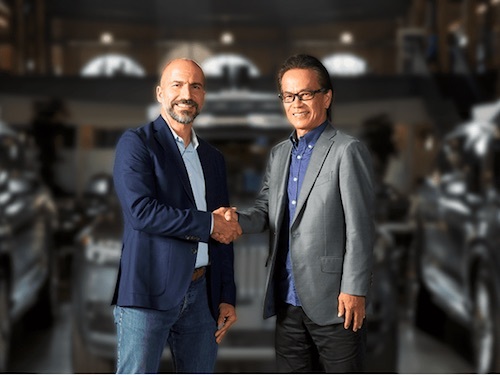 Uber's advanced technology and Toyota's commitment to safety and its renowned manufacturing prowess make this partnership a natural fit. I look forward to seeing what our teams accomplish together." The initial "Autono-MaaS" (autonomous-mobility as a service) fleet will be based on Toyota's Sienna Minivan platform. Uber's Autonomous Driving System and the Toyota Guardian automated safety support system will both be integrated into the Autono-MaaS vehicles. Toyota will also utilize its Mobility Services Platform (MSPF), its core information infrastructure for connected vehicles. Pilot-scale deployments will begin on the Uber ride-sharing network in 2021. "Uber's automated driving system and Toyota's Guardian system will independently monitor the vehicle environment and real-time situation, enhancing overall vehicle safety for both the automated driver and the vehicle," said Dr. Gill Pratt, Toyota Research Institute CEO and TMC Fellow. "We look forward to this partnership accelerating both companies' development and deployment of automated driving technology." Toyota's investment in Uber and the proposed collaboration are subject to standard regulatory approvals. Uber's mission is to bring reliable transportation to everyone, everywhere. We started in 2010 to solve a simple problem: how do you get a ride at the touch of a button? We've since completed 5 billion trips and remain committed to building a platform that enables the safe, efficient movement of people around the world. Today, the team at the Advanced Technologies Group (ATG) is tackling another challenge: how do you build and deploy self-driving technology at scale? The ATG is comprised of world-class engineering talent dedicated to vehicle safety, self-driving software, mapping, and more. Uber is taking a holistic approach to bringing self-driving vehicles to market through a variety of partnerships, with the ultimate goal of creating autonomous ridesharing at scale. Toyota Motor Corporation (TMC) is the global mobility company that introduced the Prius hybrid-electric car in 1997 and the first mass-produced fuel cell sedan, Mirai, in 2014. Headquartered in Toyota City, Japan, Toyota has been making cars since 1937. Today, Toyota proudly employs 370,000 employees in communities around the world. Together, they build around 10 million vehicles per year in 29 countries, from mainstream cars and premium vehicles to mini-vehicles and commercial trucks, and sell them in more than 170 countries under the brands Toyota, Lexus, Daihatsu and Hino. For more information, please visit www.toyota-global.com.